In 2016, Lucky Envelope Brewing was still establishing its place in Seattle’s jam-packed craft brewing landscape. The east Ballard brewery had opened the year before, but was still very much a fledgling enterprise. Co-owners and friends Barry Chan, whose background is in engineering, and Raymond Kwan, who previously worked in finance, met through a mutual friend while both were living in Los Angeles. At the same time, on the other side of the globe, archaeologists were unearthing an ancient beer recipe that would inspire the brewers, both professionally and as first-generation Chinese-Americans. At the Mijiaya dig site in China’s Shaanxi province, archeologist and doctoral candidate Jiajing Wang of Stanford University and her team had uncovered a 5,000-year-old cache of prehistoric brewing tools within two subterranean pits, including pots, jugs and funnels. They had discovered the earliest direct evidence of in situ beer production in China. Chan and Kwan heard the news and were drawn in by both the science underpinning the find—Chan had considered a career in archaeology—and their cultural connections to it. Especially relevant to Chan, who is Lucky Envelope’s brewmaster, was that the archaeologists had analyzed mashed grain and starch residues inside the vessels to render a recipe for the centuries-old beer: Job’s tears barley, millet, snake gourd, lily, yam and tubers. Growing up, his parents’ red bean soup (or tong sui), a traditional Cantonese dessert, featured lilies and Job’s tears, which are fat, tear-shaped seeds sometimes referred to as Chinese pearl barley. Chan wanted the recipe for this brew, and sent an email to Wang. “It was important to me to get her go-ahead before we brewed a beer based on her team’s research,” he says. “She ended replying, ‘Thanks for your interest and here’s the paper.’” First, Chan broke down the percentage of each grain found at the dig site to inform the proportions his team would use. Next, they visited nearly a dozen local Asian grocery food stores to find the nontraditional brewing ingredients they needed. Lucky Envelope debuted its crisp, easy-to-drink Mijiaya Historic Chinese Beer in 2017. Its sweetness is defined by lilies—the flower dried before bloom, like those used by Chan’s parents, rather than the root or bulb. The end product is as true to the ancient brew as Lucky Envelope could get—with one exception. “Beer back then was probably like a thick, slightly fermented porridge,” says Wang. Chan compared it to a slightly alcoholic congee or gruel. Indeed, in Lucky Envelope’s initial test batch, the abundance of grains called for yielded a sticky, hard-to-work-with wort—the liquid extracted through mashing. In subsequent batches, Lucky Envelope’s brewers used enzymes to degum the mash. “Our modern take on an ancient recipe included tailoring the beer to work with modern brewing equipment,” Chan says. Lucky Envelope celebrates Chinese holidays by releasing special-occasion beers, like the Mijiaya historic beer and tea-infused brews, but other offerings—like the Two Pepper Pale Ale, made with Japanese shishito peppers, and the Gotlandsdricka beer, made with smoked malts and juniper boughs for the National Day of Sweden—speak more broadly to Chan’s and Kwan’s connections to places forged through travel and food. 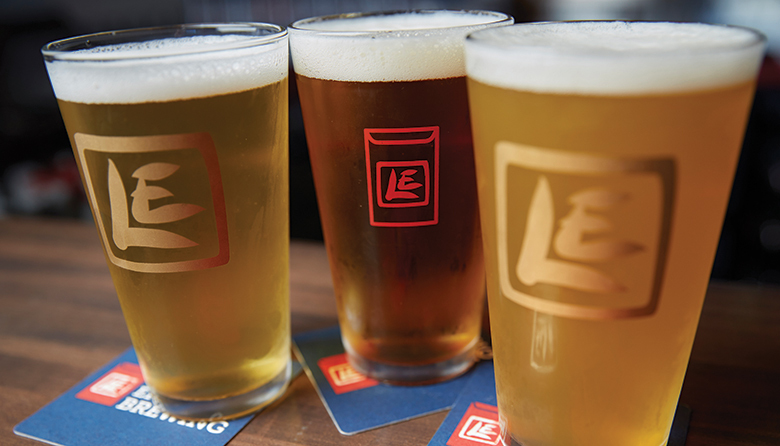 “Our traditional beers give us the flexibility to explore these more culturally inspired beers,” Kwan says. Lucky Envelope will celebrate the 2019 Chinese New Year on Friday and Saturday, February 1–2 at its taproom (Ballard, 907 NW 50th St.; 206.659.4075), and festivities will include traditional Chinese New Year decor, food trucks and a handful of special-release beers, including the following. The light and bright Mijiaya historic beer is like a cream ale/Belgian hybrid. It has a sweet aroma with a subtle hint of raisin, a touch of rye-like spiciness and a dry finish. All hopped out? This beer is for you. PAIR WITH: Whole steamed fish—which represent peace and unity in Chinese culture—served with ginger and soy sauce. The finger-like sections that emerge from the Buddha’s hand citron are individually, and painstakingly, zested to make this punchy, aromatic brew. PAIR WITH: Rich, hearty dishes like turnip cakes or dumplings. Rose petal and juicy Gewürztraminer notes come through in this sour beer brewed with lychee fruit from a tropical tree native to two Chinese provinces. PAIR WITH: Citrus such as oranges and pomelos, and dessert dishes like sweet rice cakes served (or stuffed) with red beans.